Bank of India recruitment for Office Assistant Posts. Bank of India published a new notification related to the recruitment process for office Assistant posts. Those who are interested in these Bank jobs in India can apply now. The last date to accept the application form is 31st May 2018, so the candidates have to apply before this date. All Indian Graduates are eligible to apply for these Bank jobs in India. Candidates must have the knowledge of Accounts and Computer. 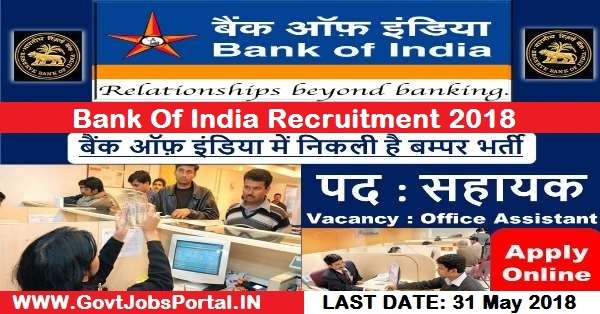 More information about this Bank of India recruitment 2018 is given below in this post. Read the whole article for detailed information. Indian candidates who completed their Graduation are eligible to apply for these Bank jobs in India. Applicants must have the basic knowledge of accounts and computer. The minimum age criteria is 18 years and candidates are eligible to apply up to 45 years. What application Fee you have to pay for applying these Bank Jobs? Those who are interested in these Bank jobs in India can apply now by paying ZERO application fees. Bank in inviting all Indian candidates to apply for these jobs with zero application fees. Candidates will go through written examination to check their aptitude and GK knowledge. Those who cleared the first round will go through the second round of interview. How To Apply for these Bank jobs in India? Candidates have to apply offline with a prescribed application form for these Bank jobs in India. There is no other way for applying these Bank jobs. Below we share the link for application form as well as for the advertisement. 31st May 2018 is the Last Date to Apply.